As the campaign for Lok Sabha elections gathers pace, Prime Minister Narendra Modi on Friday launched an attack on Opposition over seeking proof of Balakot airstrikes carried out by the Indian Air Force in the aftermath of Pulwama terror attack that claimed the lives of 40 CRPF men. 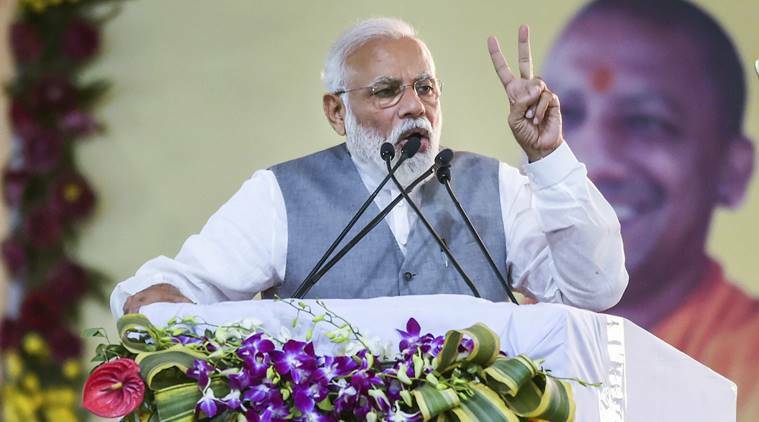 The Prime Minister, who launched and inaugurated a series of projects at three places in Uttar Pradesh urged the Opposition to stop amusing the neighbouring country by politicising Balakot airstrikes and Pulwama attack. The PM was speaking in Ghaziabad at Hindon airbase today where he launched civilian flight operations. The airbase was earlier being used for IAF operations and it a new facility was inaugurated by PM Modi for commercial purposes. “If Pakistan itself admitted about the airstrikes then why is Opposition raising such questions,” he said while referring to Pak Army’s early morning tweet that confirmed the Balakot airstrikes. He added that Pakistan is not a fool that it will lie about the airstrikes. Earlier in the day, PM visited Varanasi where he laid the foundation stone for the Kashi Vishwanath Temple’s approach road and its beautification, and also inspected the project site. After offering prayers at the temple, Modi said that he was blessed to be associated with the project of Kashi Vishwanath Dham. About the beautification project, he said this was “mukti (freedom) for Kashi Vishwanath Dham” which was surrounded with encroachment. During his brief stay in the constituency, Modi attended the National Women Livelihood Meet 2019 at Deendayal Hastkala Sankul and distributed appreciation letters to five Women Self Help Groups, whose members shared their experiences with the prime minister. In Kanpur, the prime minister laid the foundation stone of Panki Thermal Power plant and unveiled plaques to mark the launch of various development projects. He flagged off the commercial run on Lucknow Metro’s 23-km-long north-south corridor, through video conferencing from Kanpur itself and symbolically laid the foundation stone for the Agra Metro Rail project at the same event. Modi also distributed keys of houses to the beneficiaries of PM Awas Yojana. Later on Friday, the prime minister inaugurated and laid foundation stone for projects worth Rs 32,500 crore Ghaziabad. These included foundation-laying of the ambitious Regional Rail Transport System (RRTS) that would connect Delhi and Meerut via Ghaziabad, inauguration of a civil terminal building at the Hindon airport and an extension of the Delhi Metro’s Red Line. “The RRTS is being built at a cost of more than Rs 30,000 crore. Once work on the country’s first RRTS is completed, the distance between Delhi and Meerut could be covered in just one hour,” Modi told the gathering. The extension of the Delhi Metro’s Red Line, inaugurated by the prime minister in Ghaziabad, would now connect Shaheed Sthal (New Bus Adda) to Dilshad Garden in Delhi, while the civil terminal building at the Hindon Airport would facilitate commercial flights, as the aerodrome was only for Indian Air Force operations.